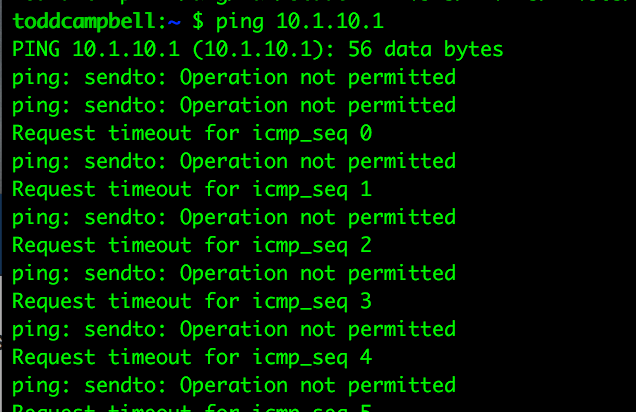 After upgrading Sierra to 10.12.4 I am now having an issue with command line network tools (ping, ssh, nslookup). Using any of these tools, such as pinging my default router, will result in the following intermittent behavior. The tool will hang (no output, but running top in another terminal window shows the process in a stuck state), then after a while it will produce output with the error "Operation not permitted". Other times, this will randomly work. I am running Security with the default settings. However, if I disable Firewall Connection Blocking, these issues go away. The issues are also not present when booted in safe made and Norton Security is not running. I had a colleague do a similar update and he is seeing the same issues, he uninstalled Norton Security to fix it on his machine. This was not an issue prior to updating to 10.12.4. I think I ran into the bug as well. Upgraded to Sierra 10.12.4 on Monday and yesterday night couldn't reach the internet after my Macbook Pro woke up from sleep - no email, no internet browser, no Norton Update. When I tried to quit my browsers and Mail client, they hung - it took multiple forced quits before they closed. I was able to regain internet access by switching my wifi from the 802.11ac 5ghz band the laptop is usually connected to a secondary 802.11n 2.4ghz band but lost internet access as soon as I switched back to the 802.11ac 5ghz. I'm pretty sure an update to Norton Security that was pushed out after 10.12.4 was released is the problem. I didn't have a lot of time to troubleshoot so I went back to Sierra 10.12.3 and will stay there until this bug is confirmed and fixed. On my MacBook Pro 2015 15in works fine my internet does not hung and my other programs work like they should. I have auto scan turned off in the settings and I have Mac OS Serra 10.12.4 I hope that Norton will release a new patch very soon to fix the problem. Any one heard for Norton tech support if there are working on the scan error bug? I am having the same issue - Mac OS Sierra 10.12.4, Norton Security 7.3.1 - the symdaemon process goes to 100% and stays there, unless I turn off automatic protection. I am a "power user," but would need steps to create log files that would be helpful in diagnosing the problem. I have also the same intermittent issue with Safari and Mozilla Firefox. They hand up for connection since I upgraded to Sierra 10.12.4. This is due to Norton Internet Security, because, when I uninstall Norton the problem is fixed. When I re-installed Norton again, the issue is appearing again. Oddly enough, I have two Macs, a Mac Pro (2013) and one MacBookPro (2016) same configuration, and the problem is occurring on my Mac Pro but not on my MacBookPro ! I suspect a compatibility issue with Sierra 10.12.4. and would like to know when a fix will be provided by Symantec. Wondering if this issue is for any version of Nortonor the Comcast Norton Security. I have the same issue after updating to Sierra 10.12.4. Everything that uses network connections, local or the internet, locks up. My Symdaemon process also goes to 100%. Switching off automatic scans makes the system workable again. I have a Macbook pro 2016. The team is investigating this issue. Please look into the Stealthmode from the Firewallsetting. - By turning on: the Apps have no Contact to the Internet (google), Mail and co.
- By turning off: all works normal and the Apps have Contact to the Net. Its impossible to load the Viruslist from the Main GUI. When The Book go to sleep the Defs run and run. But I have no Viruslist in Main GUI - On my iMac happened the same. Please find here an Solution. Same issue. What a pain. Hope this fix this one quickly. Have the same issue I am on 10.12.5. I am in contact with the support for quite a while, have sent many reports and files. No solution yet. This is an ongoing issue for years. Why can't they fix it for good? Please help and don't say all the time that the team is investigating it. Either they don't have a clue or they don't care. I have encountered this issue too. No Internet & No Mail & locked Browsers etc... It starts happening after installing 10.12.4. Hope that it will be solved quickly. Even after disabling (not deinstalling) Norton completely, SymDaemon stays at 90-110%. There is something wrong with the programming. I have found a fix that works well for me and could for several weeks. I have fallen back to Mac OS Sierra 10.12.3 which has all of the security updates that 10.12.4 offers minus some new non-security related features that are not necessary for securing your Mac against Internet attacks. This previous version works well with NIS. Apple is having serious problems currently with 10.12.4 as many Mac users have experienced Internet disconnectivity, blacked out monitors and other issues. These problems could eventually effect other security software. I would expect software patches to fix these issues from Apple, Symantec and other companies within the next couple of weeks or months. My advice to everyone is to be patient and to implement a solution that works for an extended period of time. Keep in mind that this could take weeks or months to fix! Either ditch Symantec and jump to another security program or knock your Mac back to OS Sierra version 10.12.3 which is just as safe if not safer than the newer bricked offline 10.12.4 version! I switched to KIS 2017 for one month. It seems OK. No connectivity problem is detected. I am having the same problem with Norton Antivirus 7.3.1 and Sierra 10.12.4. If I turn wifi of and on, sometimes that allows a few minutes of the internet working before it shuts down again. If I open Network Diagnostics, then Wifi, Wifi Settings, and Network settings are green, while ISP, Internet and Server and yellow or red. Using Network Diagnostics won't fix this but turning wifi on and off, or switching to another wifi network, will briefly work. And then if I've switched from a secure to a non-secure network, or back again, as soon as Norton signals that it has recognized the switch from the type of network, then the network is blocked again. I have turned off the "Connection Blocking" in Norton and that's the only thing that allows the network to work. So from my viewpoint it seems to be an issue with the firewall created by Norton. Further to this, I tried following the suggestion above about shutting off idle scans. But as soon as I turned "Connection Blocking" back on, it blocked the internet. And after restarting, with idle scans shut off, the internet blocked again. It seems only with "Connection Blocking" off that the wifi consistently works. For me, it is very clearly related to the "Automatic Scans" setting in the "Advanced" Pillar. When I turn Automatic Scans off, the problem goes away. When I turn it on, the problem predictable recurs. I would be happy to provide any logs/traces/etc if given steps on how to produce them for you (I am an experienced Mac/Unix user, so wouldn't need too much hand holding). I can add that I've got a half-dozen Macs running NAV (laptops and desktops) among my family, and with all of them, turning off "connection blocking" has solved the issue. I have encountered the same problem since upgrading to Sierra 10.12.4 using Norton Security 7.3.1 (build 21). Usually the problems appear some time after boot (often after waking the computer from sleep). All processes that require network connections freeze (Chrome, Safari, LiveUpdate, printing, ping...) and NFMWps gets stuck using 100% CPU. It sometimes requires a forced reboot via command line to be able to work again. I've found that disabling Connection Blocking (and force quitting NFMWps) seems to do the trick (with the obvious downside that I am not really able to use the product I bought...). I have not tried disabling the "Automatic Scans" but I am not really sure if this would be preferable to disabling Connection Blocking. Uninstalling and reinstalling Norton Security (even erasing all related files) has no impact whatsoever. It is a bit disheartening that roughly 20 days later there seems to be no solution to this problem. More than 20 days, one would assume. Any ISV worth its salt would be working with Apple and have access to release candidates and betas of the new OS and be prepared for any changes that would be forthcoming. That certainly doesn't appear to be the case here though. Disabling all the securities option in the firewall in advanced settings of connections blocking looks like to work, the firewall isn't blocking connections with all optional settings "off" but this is still slowing down the first time a new application make a connection. But what is Symantec doing ??????? This setting cannot be permanent because of course then the firewall isn't of any use in term of security. Is now eons since Sierra has been upgraded and we don't see a fix coming ? Do you thing that Symantec would refund clients ? This Norton BUG prevents use of my computer for any network connection!!!!!! When will a fix become available. Been waiting more than a month. The problem started showing up with Mac OS 10.12.4 and now its been so long waiting for a fix that Mac OS 10.12.5 will be available soon! When the fix is available, will it work with 10.12.5??? Please confirm if this 7.4 release resolves the issue. Same here so far! When I started my i7 iMac I was first promoted by Norton Security to upgrade. After that mac OS 10.12.4 prompted its own installation and I went through that process as well. I am running Norton Security version 7.4 smoothly now. Thanks for the fix Symantec! It has solved the connection blocking problem for me on all computers, and also the issue that the application would fail and require "fix now" if I requested a full scan. As far as Sierra is concerned - the problem is solved. But on my Mac Book Pro with El Capitan I now have some problems. This morning Norton IS made the update there as well. After restart it was not possible to start Norton. When I clicked on the icon in the menu bar, the icon in dock started to jump just for a moment and disappeared - nothing happened. I tried to restart my MBP with command/R and fix this with the hard disk utility (ist this the correct name in english??) by using first aid. But my Macintosh HD was visible but not available vor fist aid. But the information showed a bar totally filled in orange - no free space on my HD. But this is nonsense. After restart I opened HD Utility again and it showed the correct free and used space on HD. By the way, a klick on apple/restart shuts down the MBP - no restart automatically - I have to press the hardware button. Even a start holding down shift to start in secure mode does not work properly. So far, so good! Never been so happy to see a LiveUpdate. Thanks for your efforts. Unfortunately SymDaemon still at 102%. Fan running constantly. While this does fully fix the Sierra glitches or bugs there still is a minor bug in El Capitan. The far left security button which usually stays green and says "Protected" is stuck at the red "At Risk" warning prompt even after hitting the fix button repeatedly. The Internet appears to be working fine but that red button keeps telling me that my Mac is unprotected! This issue for me is happening on a 2009 2.53 GHz Mac Mini running El Capitan 10.11.6. Norton Security is also telling me that "Your Vulnerability Protection Definitions are not up to date" and that "Your Mac may be at risk." This is after continuously hitting the Live Update button. It should click to green but it does not! This could mean one of two things: That missing definitions did not get installed or that the message is in error. In any event, the glitch or bug is still not 100% solved yet! I'm still having issues in 10.12.4 Sierra! Now the exact same issue that is effecting my 2009 2.53 GHz dual core Mac Mini running El Capitan 10.11.6 is happening on my 2013 2.7 GHz i5 21.5" iMac in Sierra. The button on the far left is red and says that my Mac is unprotected and that important definitions are missing but when I hit the update button it goes through a scan and at the end of the scan it says that the updates are complete or something along that line. Meanwhile, that button is still red. So while I can use the Internet and perform scans in Norton Security there are updates that are not getting installed or at least that is what the button on the far left is telling me. This problem is definitely NOT 100% solved yet but this is a better place to be at currently! Update from the above message: I have four Macs running Norton Security. Two accepted the update while two choked on it. One that choked had Sierra running on it while the other had El Capitan so I followed Violpeter's lead above and uninstalled Norton Security on my 2009 Mac Mini and my 2013 i5 iMac. I did the basic uninstall in the Norton program but that was not enough because when I reinstalled it the broken red box returned again. So I uninstalled from inside of the Symantec program once again and ran Symantec's Terminal app in order to remove all of the hidden system files connected to Norton Security before reinstalling the program one more time. This second approach worked perfectly. All four of my Macs are up and running now very smoothly with mac OS 10.12.4 and Norton Security 7.4 working together with no more problems whatsoever! Thanks for the fix Symantec. It finally worked for me but not without having to sacrifice hours and hours and hours of my time to do it. I am really hoping that most people do not have to take the extra steps that I had to take. I am hoping that, for them, their upgrades go as smoothly as my first two Macs went which were no work at all and not the last two that refused to take the fix initially. After the update it works better, although My NFMWps process still seems to get stuck using 100% CPU and triggers the fan... At least the network connections work. I also installed Norton 7.4 on 2 MacBook Pro's running 10.12.4 and they now work OK. I had to UNINSTALL Norton AND also remove the hidden files as Jeffrey Knakal said in his comment above. Thanks to Norton engineering for the fix, although I really wish this had been tested before the Mac OS 10.12.4 release. I wasted a lot of time trying to get my system running and had to uninstall Norton just to get a network connection. BTW, I would not have been able to download the fix if I had not uninstalled Norton since there was no network connectivity (catch 22!). I hope the upcoming 10.12.5 will now work OK??? This thread gave me hope that there was a fix in 7.4, but I am already running 7.4 and 10.12.4. i have to turn connection blocking off so my email app (Outlook 2016 Mac) will work properly. Reading all of this makes me realize I am not going crazy! I have had all of the same issues, fan running, connection issues, AND Skype for Business Mac connection issues. I am certain it is related, and I still have the fan and Skype for Business issues (can't connect to the server messages constantly, my status does not update - always show away, etc). Changing Norton Security's settings according to Mohan_G's post resolved the above issue.